Writing a to-do list is supposed to help us feel less scattered and more prepared to take on the day, but sometimes when I make up my to-do list I’m left feeling absolutely overwhelmed by all the items that end up on it. Does that ever happen to you? It’s hard enough to strike a balance between all the different hats we wear and then we add in those lists of all the things we need to get done and it can leave us feeling more than a little overwhelmed. That’s one of the many reasons why I always keep a few copies of the daily task list planner on hand. 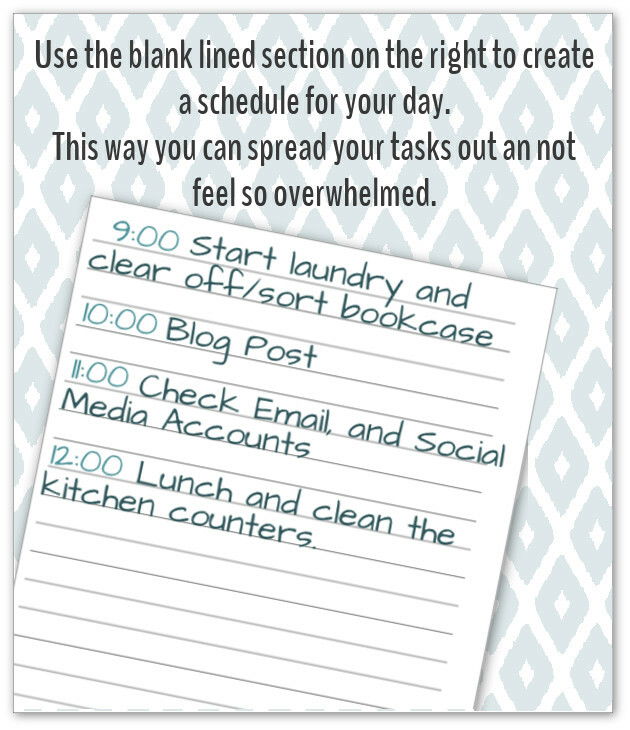 A daily task list planner can be a great tool to help keep that overwhelm at bay. It allows us to take our to-do lists and break them down into reasonable chunks that we can tackle in the time we have. This daily planner printable was originally designed in response to a reader request for the 31 Days 31 Printables series I did a few years ago, and it’s become a staple in my planner. I pull it out whenever I start feeling overwhelmed by my to-do list. 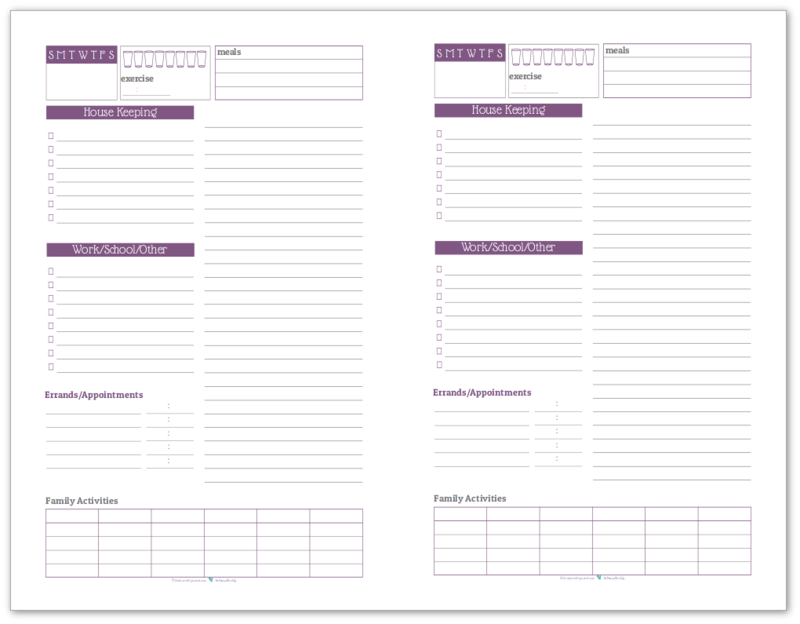 One of my favourite things about this planner printable is that it really helps to create a structure for the day, yet still offers some flexibility for how you could use it. While I am sure there are many ways you can use it, I can only talk about how I use it. I gravitate towards weekly planners normally, but there are those times when life gets really busy, or I’ve gotten too far off balance and need to get back on track. Both those situations usually mean I’m left with a to-do list a mile long and a strong desire to find a corner to cry in while secretly hoping that my to-do list will magically do itself. That’s when I break out the daily task list planner and use it (or many of them if need be) to tame the to-do list beast and help me climb out of the overwhelmed feeling. The first thing I do is make my to-do list. The next thing I do, which might sound counter-productive, is to take a look at any generalized item on it, such as clean the kitchen and break that down into more specific steps. Yes, I just added a few more things to my to-do list, but having more specific tasks helps me determine how much time I’m really going to need to do each thing. I use a different coloured highlighter for each priority level to make the next steps easier. I pull out a few daily task lists and start filling them out. I circle the initial of the day and write the date in the box below. Note any meals or baking I have planned for that day and then the fun starts. 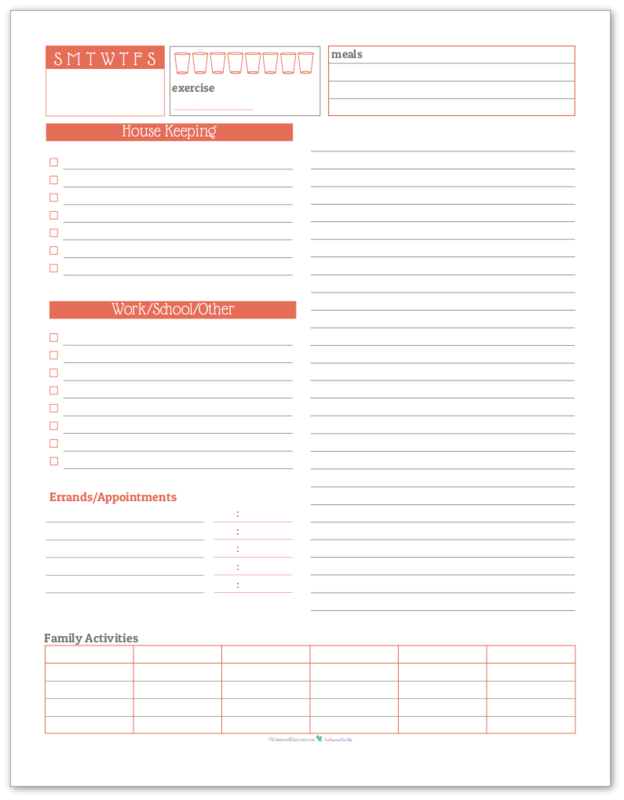 Using my highlighted to-do list I start filling out the sections – House Keeping, Work/School, Errands/Appointments and Family Activities. This next step is the crucial part for beating back those feelings of overwhelm – once a section is full I move on to the next daily task list. This is why I pull out multiple copies because I know I can’t get everything done in one day. I keep doing that until I run out of items in my top two priorities. The next two allow me a little more flexibility in my plan and I also use them for those days when I get everything on my list finished but still have some extra time to tackle something else. I use the right-hand side for planning my day each morning. I write times down the left side and assign tasks, that way I can make sure I’m allowing time for my normal daily routines and to-dos. I’ve also started using the Family Activities section to assign tasks to the rest of the family, when appropriate. This allows me to free up a little bit of my time and also helps hold me accountable for making sure that they boys are pitching in when they should be. I am a firm believer in everyone should help maintain the home, but it’s not something I enforce as often I should. Something I’m working on getting better at. 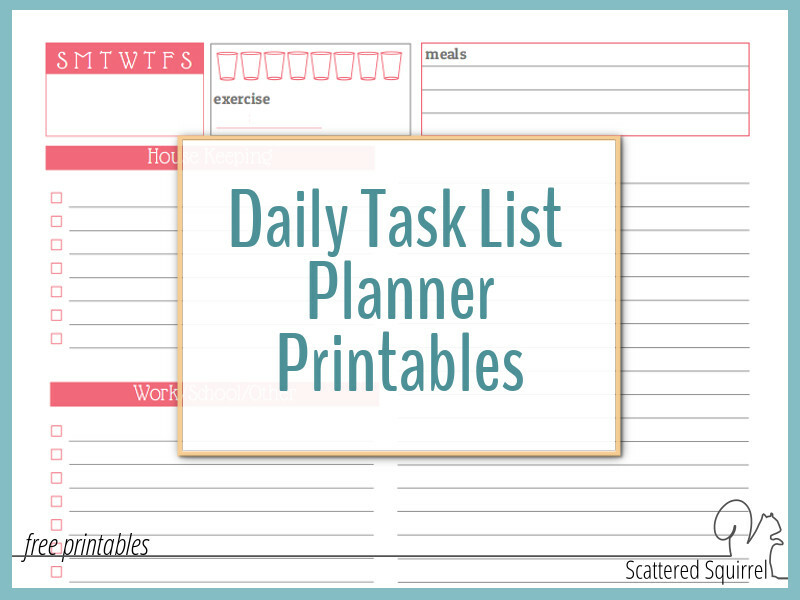 Now that I’ve shared how I use the daily task list planner to help keep me from feeling overwhelmed by my to-do list, it’s time for the fun part! I updated the original to match the Understated Rainbow Planner collection. Pick your favourite colour/s or all of them, and enjoy! As always, to snag a copy of the printables for yourself simply click the pic! Either the PDF will open for you in this window, and you can choose to save or print from there, or a dialog box will open prompting you to save, or it might automatically download. Which option you get depends on the browser you’re using, the device you’re using, as well as the settings you have set for your browser. The full-size version prints on regular letter size paper. If you’d like you can start with a weekly overview planner, and then print seven copies of the matching daily task list planner to create a full week for your planner. But these work just fine all on their own. The half-size also prints on standard letter size paper. Once you’ve printed them, cut in half so they will fit in the Arc Junior notebooks or mini-binders. If you’re using an A5 planner you might need to trim them down a little further. For best printing results make sure you go to your printer settings and selecting landscape orientation. Also, be sure to print actual file size and make sure to double check your margins. 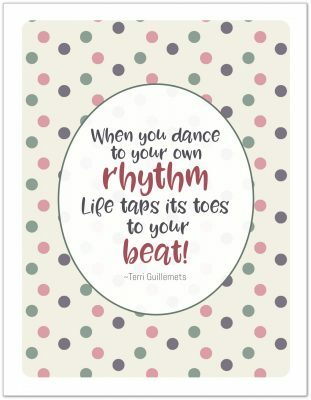 I design all the printables with a 1.2 cm (1/2 inch) border on all sides. Sometimes printer margins add extra padding to that and can mess up the size of the printed area. This is much more noticeable on the half-size printables. Using the daily task list planner to help keep from being overwhelmed by my to-do list has been a huge help. I may not use them all the time, but having them on hand when I need them has been a sanity saver to be sure. I hope you enjoy them and find them as helpful as I do. What do you think of them? Do you already use the original version? If so, how are you using it? Thanks so much for all your free printables. I love them so much. You are a blessing. Thank you so much for these 🙂 I’m still trying to find my planner peace, so going to give these a try. I like your colors, too. Thanks Melanie. 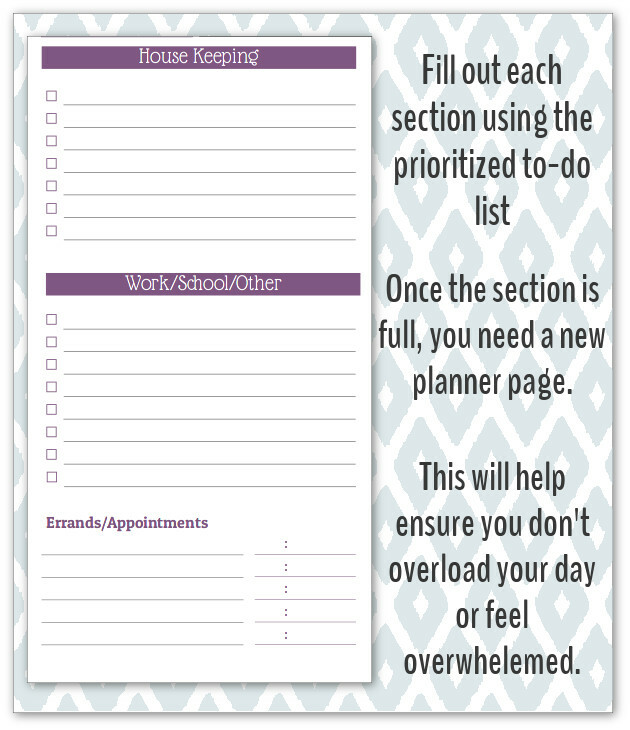 I hope you find a few printables that help you find that planner peace. Your site is a wonderful resource and I love the options you give people. Is there some way we can support you to thank you for all you do? Your website is AMAZING!!!!!! Thank you for all that you do for all of us scatter-brained people!!! HA I’m sure God will bless you many times over for all taht you provide. Thank you so much for the beautiful planners..
Hi Neny, you are most welcome. I’m happy to hear that you’re liking and using the printables. Enjoy! Do you have the 2017 version available yet? I love the Understated Rainbow colors and that it starts on a Sunday (which is getting harder and harder to find). I am incorporating more and more of your planner sheets into my planner, so excited!! I’m so happy to hear that you like them Janet. I’m hoping to add more Sunday starts to the collections soon.